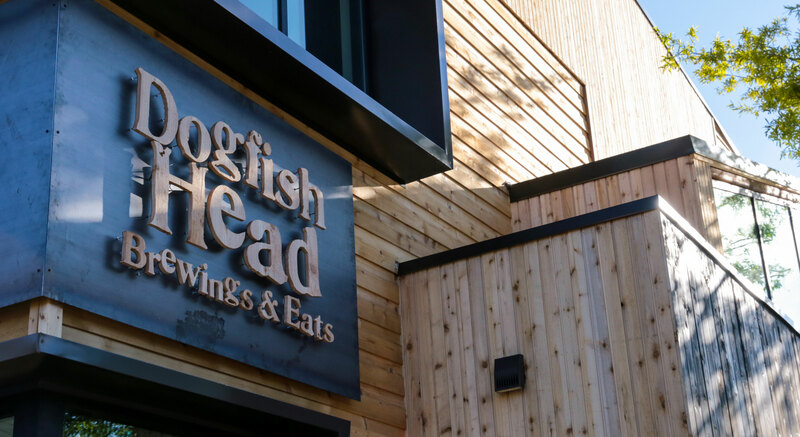 Sunday-Thursday: 11 a.m. – 11 p.m.
Sunday Brunch: 11 a.m. - 3 p.m.
Epitomizing the soul of Dogfish Head since 1995, Brewings & Eats originated as the smallest commercial brewery in the United States and the beginning of the Dogfish Head story. Brewing only two or three 10 gallon batches a day on a glorified homebrew system, Dogfish founder Sam Calagione had the flexibility to indulge his off-centered whims, wandering into the brewpub’s kitchen to grab handfuls of raisins, a cup of maple syrup and even a scoop (or two) of roasted chicory. It wasn’t long before Sam’s ever-hungry imagination lead him to experimenting with small batch vodkas, gins and rums, and in 2002 he began honing recipes and building a loyal cadre of spirit drinkers among guests. Serving up a menu of wood-grilled dishes and live music on the weekends, Brewings & Eats became known as the home of Original Beer, Original Spirits, Original Food and Original Music. After over two decades in Rehoboth, we opened the new Brewings & Eats right next door to our original space with the same commitment to world-class food, beer, spirits and music. Our scratch-made brewpub menu features original pub fare like our Crab Corn Chowder, Seafood Tacos, House Baked Pretzel Bites and wood-grilled Indulgence Burger, alongside a selection of wood-fired pizzas from our stone hearth oven, sandwiches and tacos, soups and salads, and entrees! Phew! Stop by for a selection of off-centered ales including cask beers and Brewpub Exclusives only available at Brewings & Eats, as well as creative cocktails. We can fill up your Crowler or growler to-go! Throughout the pub, you’ll find artwork celebrating the creative, rebellious connection of three American art forms: punk rock, hip-hop, and craft brewing. Our state-of-the-art stage hosts regional and national acts all year-round, strengthening our sentiment that the enjoyment of a beautiful beer while listening to original music at the same time is an exponentially awesome experience. Musicians...wanna perform Dogfish Head Brewings & Eats? Send your info or electronic press kit to MusicBooking@dogfish.com and we’ll get you in touch with our music booking guy. We are open seven days a week for lunch and dinner beginning at 11 am.